Over-the-counter medications are well-tolerated by most people, hence the chance of adverse drug reaction is very slim for them. But before taking any of these over-the-counter medications, make sure you check their expiry date, ingredients, and follow the instructions and warning printed on the bottle, pack or pamphlets. Also, take special precautions when giving these medications to children and elderly people. 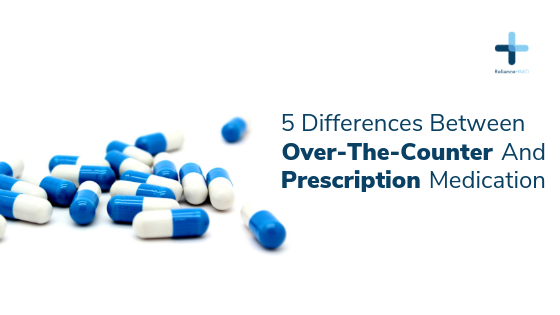 Prescription medications have a potential for abuse due to their highly addictive property than over-the-counter medications; they also have a lot of side effects which manifest in many people taking them, unlike over-the-counter medications. Hence, it is advisable to take them as instructed by the doctor (avoid overdosing yourself). In addition, you will be required to revisit your doctor if you exhaust a prescription for a review to determine if another round of prescription will be necessary. Whether it is an over-the-counter or prescription medication, never take more than printed or instructed dose at any point in time. For pregnant women, always consult your doctor before you take any medications, even if they are over-the-counter like supplements and paracetamol. Do not hesitate to stop any drugs you’re taking and report to your doctor if you react to such drugs, and don’t forget to remind another doctor of this reaction if he or she wants to prescribe same drugs for you in a different setting.